Yuneec International, one of the world’s most influential high-tech enterprises in electric aviation, announces today the launch of its new Typhoon - H platform. 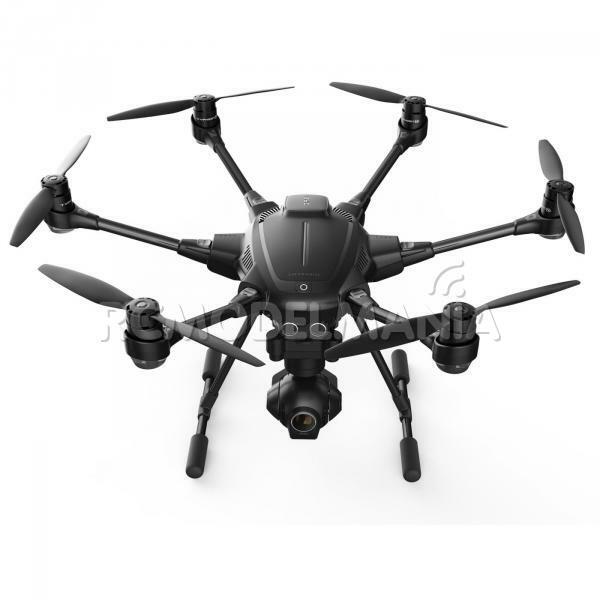 This ground breaking new design falls within the very successful Typhoon range of camera drones and features a hex configuration with six folding arms, quick release props and retractable undercarriage. 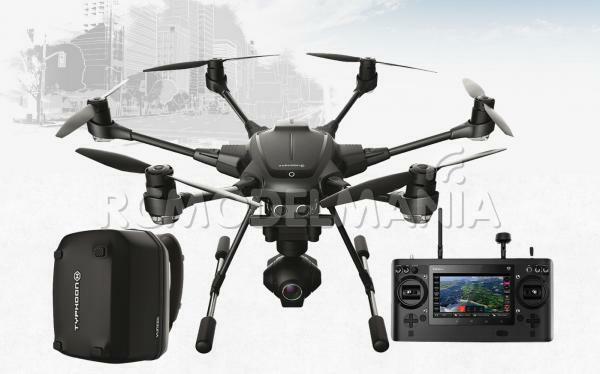 The Typhoon H platform includes latest technologies like a smart anti-collision system together with a 4K camera and new advanced 360° gimbal resulting in the Typhoon H being one of the most advanced camera platforms in the market todays. The key innovative feature of the Typhoon H is the collision avoidance technology based on the 'RealSense' solution from Intel. It combines laser infra-red and ultra-sonic sensor technologies to detect and avoid even moving obstacles which might cross the flight path of the Typhoon H. The Typhoon H will take evasive manoeuvres as needed autonomously. It works perfectly in congested areas offering a carefree follow me function like it has never been seen before. The RealSense technology by Intel offers several smart functions integrated into the system including CYCLE, Point of interest (POI), Curve Cable Cam (CCC), JOURNEY and Front Ultrasound Sensor function. These functions add to the other proven safety features from Yuneec like Geo-fencing, Dynamic Return home, Low Battery Return Home and No Fly Zones. CYCLE and POINT OF INTEREST (POI): Ensure the TYPHOON flies around the pilot or any object with the camera frame capturing the centre point all times. CCURVE CABLE CAM (CCC): When enabled, the TYPHOON H is able to record flight paths and will fly along the pre-set route automatically, empowering you to focus on the camera control during the flight. JOURNEY: Enables the TYPHOON to shoot aerial selfies of any target. When the Journey function is activated, the TYPHOON will fly away from the pilot first and then fly back, with its camera always fixed on the target to make a fabulous selfie. FRONT ULTRASOUND REALSENSE SENSOR: Assists the aircraft to detect obstacles in front of the Typhoon H during the flight for better safety and intelligence purposes. Once detected the aircraft avoids a collision and dodges the obstacle. The airframe of the Typhoon H comes in a hex configuration, with 5 motor flight capability, for maximum safety. 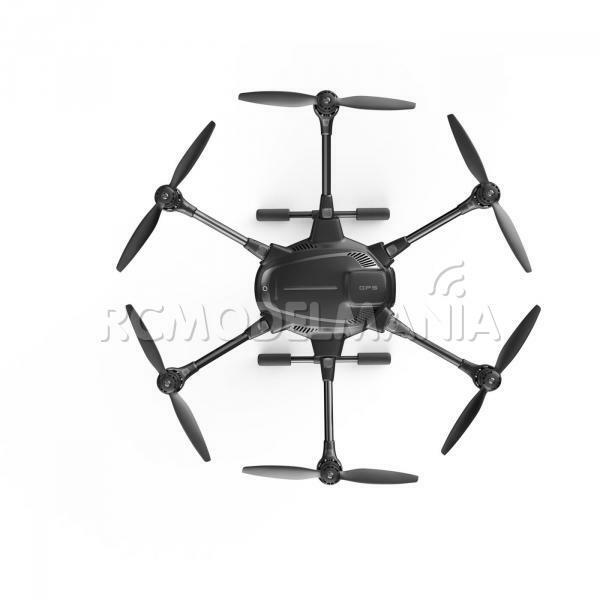 The hex configuration also enhances stability and flight performance making Typhoon H an advanced aerial video and photo platform for both skilled and hobby pilots as well as video makers and photographers. The airframe includes more advanced features besides the hex configuration including folding arms and 'quick-lock' props for easy transportation in the included hard backpack. 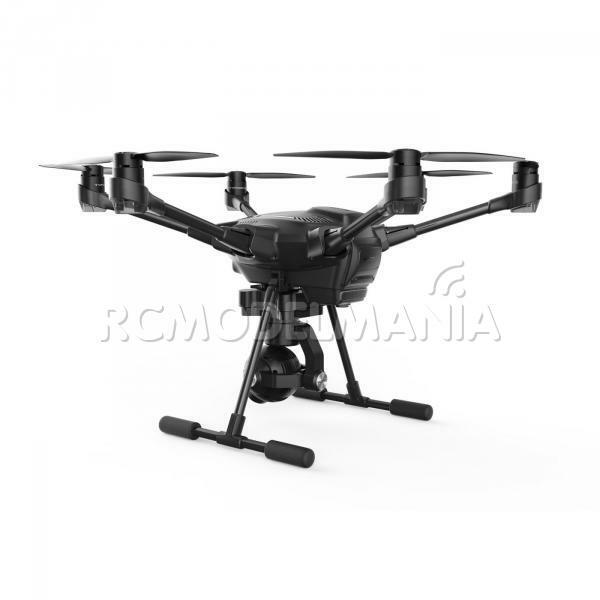 It also features retractable landing gear creating an obstacle free line of sight for the 4K camera. The flight time of the Typhoon H platform while filming is approximately 22 minutes. 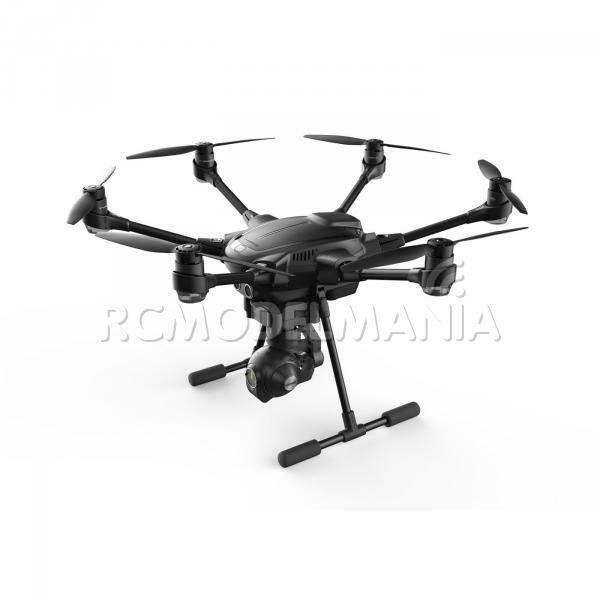 The Typhoon H comes with the proven 3-axis CGO3+ gimbal camera offering 4K resolution. The gimbal itself can be rotated 360° in any direction and the camera can be pointed wherever needed, capturing silky smooth videos and vivid images as a result of the optimized 115° wide angle fixed focused lens. The video can be downlinked through the secure 5.8GHz digital video downlink with a real-time 720p HD downlink. The camera is also able to shoot slow motion video at 1080p at 120 frames per second. Camera settings like video resolution, white balance, light exposure (automatic or manual), ISO and shutter speed can be adjusted remotely from the ground. Photos can be taken while recording a video and the still images are available in RAW (DNG) and JPEG format. The Typhoon H comes with the Yuneec ST16 personal ground station, a perfect controller and ground station to both fly and control all the settings on the aircraft, gimbal and camera through an intuitive user interface. The ST16 is equipped with a 7“ Android, colour, touchscreen for easy interaction. The screen displays the downlinked video as well as flight information and telemetry data. 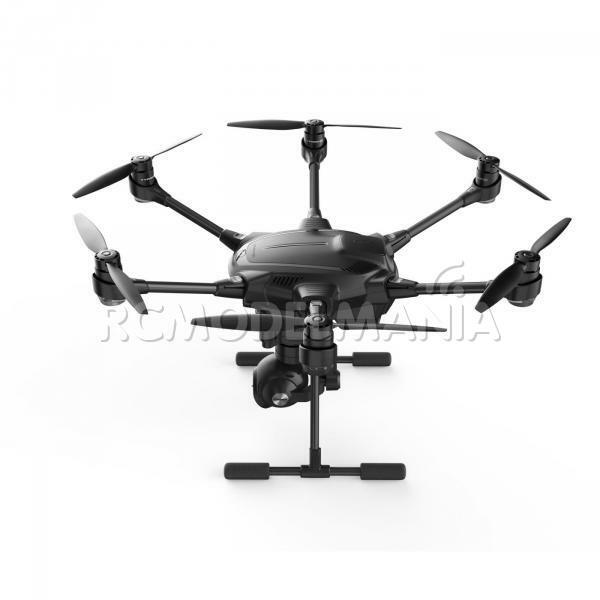 The Typhoon H is an advanced aerial photography and videography platform. Thanks to YUNEEC's spirit of innovation and pursuit of advanced technology the TYPHOON H is the smallest and smartest member of the TYPHOON family and the perfect choice for both skilled and novice pilots and photographers. ST16 Personal Ground Station remote controller - with in-built 7-inch Android touchscreen for viewing superb FPV action. The Typhoon H fits perfectly into its hardshell storage backpack included with the set. So, out in the urban world, at home or in the boot of your car, your Typhoon H is always fully protected. In addition all the accessories included with Typhoon H fit into this stylish, high quality black coloured backpack making it the perfect choice for transporting your Typhoon H everywhere.